Special agents and spies never go out of style. Whether they’re the focus of a movie, the headline of a news story or the fantasy of a child, spies are pretty cool. With new and exciting gadgets, flashy tech and the ability to slip into the shadows at will, it’s hard not to see the appeal of being a special agent in some big, mysterious organization. But what if that organization was toppled on its head and you had to start from scratch? Can these agents really do everything that makes them cool without the backing of a big organization? Invisible Inc. takes that interesting question as its premise and though it never fully realizes that story, it’s a fun ride along the way. Invisible Inc. starts off with a promising and mesmerizing opening cut scene. Beautifully drawn and animated characters conduct what looks like a run of the mill operation, only to be brought down by the evil bad guys at the end. This type of opening served as a great way to engage early on, but sadly it doesn’t happen throughout the game. Early on in Invisible Inc. you learn about a couple of characters, their plights and their motivations but nothing is ever fully explored. Instead, you play through a basic tutorial to get you started on how the world of Invisible Inc. works. First and foremost, Invisible Inc. is a randomly generated, turn-based stealth RPG. 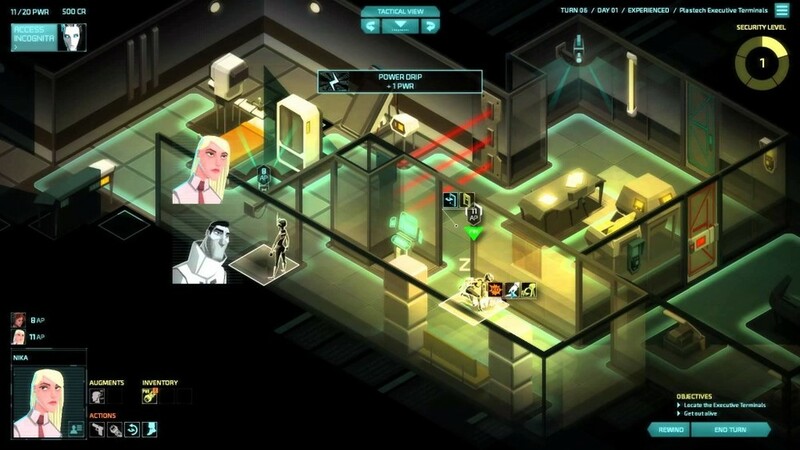 The systems in Invisible Inc. include the basic movement by squares, hiding behind objects to avoid vision cones, hacking and peeking around corners. You’re a stealth agent and therefore you are weak and squishy, it doesn’t take much to be killed and when you die, you’re gone for good. Agents that die in-game are lost forever unless rescued in a later mission. Having all mission agents die causes the campaign to end. This leaves the player with experience points for their profile and a new game to start. Invisible Inc. is challenging and is the type of game that needs to be played more than once in order to be fully explored. Running through one campaign, a feat that takes about four hours, will let you see some of the game but there is a deep system for experimentation and exploration. Unlocking new agents and abilities as you go through the game is where the experimentation becomes so obvious. You can specialize in different takedowns and skill sets so that one playthrough feels almost entirely different than the previous one. This depth is one of the best parts of the game as you feel like you’re missing out on parts of the game by not trying other forms of gameplay. Unfortunately, the story in the game is static, a problem that makes running through the campaign over and over feel dry and pointless at times. It doesn’t help that missions often follow the same formula as well. Missions in Invisible Inc. follow a “get the objective and get out” formula that rarely changes. Sure, sometimes you’re retrieving intelligence and other times you’re retrieving a vault key that unlocks better collectibles in the next level but the base formula is the same. Agents are dropped into a level with little to no direction on where to go. It becomes a race against time to explore the level, find your objective and get out without alerting too many guards or having the security meter raise too much. Each turn you take adds to the security level meter, once it completes a full circle the security level raises and a new threat enters the level. This could be anything form additional cameras to new and harder-to-beat enemies. This makes it more important to be efficient with your moves, measuring the cost of each move and the hope that you won’t waste time exploring a dead end. Where this formula becomes a problem is when a level feels overly crowded. This causes needless exploration as well as moments where it’s hard to see what’s going on. I found myself caught and killed a few times due to the over abundance of stuff in a single level. Missions work on the basis of time with each mission taking a certain number of hours to travel to. After 72 hours of traveling and completing missions you have to take on the final mission, so utilizing those other 72 hours to collect enough upgrades and skills is paramount. It may seem crazy to waste 12 hours for a single upgrade that’s far away but it might be something you desperately need to succeed. On the same line of thought, it may seem sensible to do all of the missions that are close together but doing so may result in little to no reward in terms of progression. Weighing these options against one another is what makes Invisible Inc. a joy to play, it’s the game’s best quality. Choosing what to do and when is a constant factor in the game, and not just in-mission. These decisions lead to a lot of moments where seeing how another choice would’ve turned out is all you can think about, lending to the game’s excellent replayability. The RPG system in Invisible Inc. is deep enough to warrant multiple playthroughs as well. Stats can be upgraded after each mission and depending on the stats you spend experience on and the items and upgrades you choose to utilize, your playthrough can vary from mission to mission let alone campaign to campaign. It’s this sense of deep replayability that stopped me from disliking Invisible Inc. and feeling like I was cheated out of a full game. Sure, the campaign is short and the gameplay is easy to learn but there is a lot of depth to master and that doesn’t come across right at the beginning of the game. Invisible Inc. is a game with a lot of hidden depth that is waiting to be explored and exploited; and while the story is severely lacking it’s still worth the $20 to checkout and run through a few times. Imprint-X has style and that goes a long way in terms of making the game stand out. Without its look and without its music it really is just a simplistic game about clicking to solve puzzles. Solving the puzzles provides a sense of accomplishment at times but overall there is no greater purpose or reason to solve them other than the game wants you to. Sure, the game had me wondering if I should build a better diet or waste money on the equivalent of steroids and just go for it. Is that fun to actually play? No, not really.